When Bob Goldberg was given a diagnosis of Alzheimer's and Parkinson's diseases, he was dubious and decided to get another opinion at Mayo Clinic. A year later, after two successful surgeries, Bob can once again think clearly and walk on his own. Bob Goldberg has always been great with numbers. His natural ability to do rapid computations helped him go from working as a messenger for the Chicago Board of Trade in 1958 at age 15 to becoming a broker in 1963 to serving as the exchange's chairman in 1985. "I always liked doing things that required a quick reaction time and making quick decisions," Bob says. So in October 2017, when the 76-year-old couldn't add two simple numbers together, Bob became concerned. He and his wife began noticing other symptoms, as well, including lack of balance and coordination, confused thinking and, within a short period of time, the inability to walk. The Goldbergs spend winters in Sarasota, Florida. After seeing his primary care doctor there and getting an MRI, Bob was referred to a local neurology practice. He had further testing and was diagnosed with Alzheimer's disease and Parkinson's disease. "They gave me a book to read about Alzheimer's and the names of the two drugs to slow down its progression," says Kathy, Bob's wife. "At that point I stood up and said, 'No, we're not going to do that. The doctor asked, 'What are you going to do?' and I said, 'We're going to go to Mayo.'" After that, Bob's condition continued to deteriorate. His balance got so bad that he fell several times, and he was forced to use a wheelchair. "Once he fell, he couldn't get up. He couldn't lift his arms or legs. I had to get him on a rug and pull him," Kathy says. "He just kept getting worse by the day, and I would have to lift his legs to get him into the car. He couldn't shower or go to the bathroom by himself. We all thought he was going to die." Kathy's worry mirrored Bob's own concern for his well-being. "I knew something was very wrong. The things I was once able to do to take care of myself, I could no longer do. I was scared and confused," Bob says. "But I was going to go to the best of the best to figure it out." At the end of January 2018, Bob had an appointment at Mayo Clinic's Rochester campus, where he met with Orhun Kantarci, M.D., a Mayo Clinic neurologist, along with a neurology fellow. "The fellow started examining Bob. Forty-five minutes into the appointment, he turned and asked the two of us, 'Hasn't anyone mentioned normal pressure hydrocephalus to you?' Bob and I had never heard of it," Kathy says. The neurologists at Mayo suspected that there were two underlying conditions triggering Bob's symptoms: a combination of spinal stenosis and normal pressure hydrocephalus. Spinal stenosis is a narrowing of the spaces within the spine, which can put pressure on the nerves that travel through the spine. Normal pressure hydrocephalus happens when the fluid-filled chambers in the brain, called ventricles, become enlarged, due to an accumulation of extra cerebrospinal fluid, and press on the brain, even though the fluid pressure within the chambers remains normal. To ease the symptoms being caused by normal pressure hydrocephalus, Bob underwent a high-volume spinal tap to drain the excess fluid. The result was a rapid change in mobility that thrilled Kathy and Bob. "The most encouraging part was no one knew what it was and couldn't help me get better, and within an hour after arriving at Mayo, I heard the words, 'We can fix this.'" "They drained five big tubes of cerebrospinal fluid, and he was able to walk down the hall," Kathy says. "I started to cry." "The most encouraging part was no one knew what it was and couldn't help me get better, and within an hour after arriving at Mayo, I heard the words, 'We can fix this,'" Bob says. "There was a lot of professionalism and compassion." 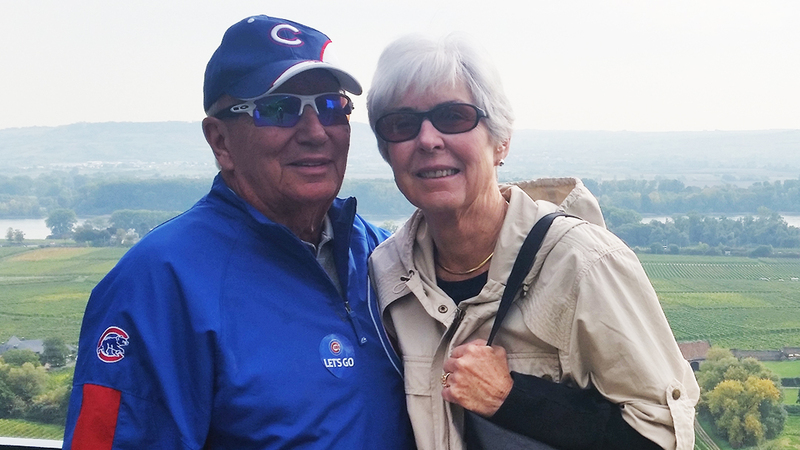 To achieve long-term relief of Bob's symptoms, his care team believed surgery would be necessary. He was referred for a neurosurgical evaluation to Joshua Hughes, M.D., Mayo Clinic's chief neurosurgery resident at the time, and neurosurgeon Benjamin Elder, M.D., Ph.D. Dr. Elder and Dr. Hughes agreed Bob had symptoms of cervical myelopathy — a condition related to spinal stenosis that leads to imbalance and arm, hand and leg weakness when the spinal cord becomes compressed — and normal pressure hydrocephalus. Addressing both conditions would require two surgeries. First, they recommended Bob undergo a posterior cervical decompression and fusion procedure. That surgery would relieve the spinal cord compression and stabilize Bob's neck. Second, the surgeons proposed that Bob have another procedure one to two months after the first surgery to place a ventriculoperitoneal shunt. The shunt would act as a drainage system for the excess cerebrospinal fluid, so the fluid would no longer build up in the ventricles. After hearing that plan, Bob and Kathy were ready to go ahead with the first surgery. "We had so much confidence in all of the doctors," Kathy says. "They were so confident and calm." Three days after Bob's consult with them, Dr. Elder and Dr. Hughes performed the decompression and fusion procedure. Afterward Bob returned home to Chicago. Over the next six weeks, he wore a neck brace and participated in rehabilitation to aid in his recovery. On March 23, Dr. Hughes and Dr. Elder implanted the ventriculoperitoneal shunt in Bob's brain. That surgery involved placing a long, flexible tube in one of the brain's ventricles. The tube has a valve on it that keeps fluid from the brain flowing in the right direction at the proper rate. The tube is run to another part of the body, so the excess cerebrospinal fluid drains into an area where it can be absorbed more easily, such as the abdomen. "Dr. Hughes came out and said everything went well," Kathy says. "That afternoon, Bob got up and walked. It was unbelievable. Just to see him walking down the hall was a miracle." "It was a privilege that Dr. Hughes and I were able to help treat both his spinal cord compression and hydrocephalus and help him return to a more normal life." Bob stayed in the hospital for 18 days after his second surgery, and he did speech and physical therapy as part of the recovery process. "Everyone was so caring. If he ever put his light on, they were there in seconds," Kathy says. "They have a compassion that I haven't seen at most places. It's a whole different feeling. You feel like it's family taking care of family because they care." After returning home, Bob had physical, occupational and speech therapy for 12 weeks. He continues to work with a therapist twice a week on his mental focus and memory retention. But the overall improvement in his condition since the surgeries has been dramatic. "It's wonderful to see Bob go from being wheelchair-bound to being able to walk and return to many of his prior activities. I remember how excited he was to show off how well he was able to walk in the hospital immediately following the shunt surgery, and he's only improved from there," Dr. Elder says. "It was a privilege that Dr. Hughes and I were able to help treat both his spinal cord compression and hydrocephalus and help him return to a more normal life." In September, the Goldbergs returned from a trip to London, where they walked for hours taking in the sights, seeing a musical and enjoying family. "Just eight months ago, he couldn't move or put a sentence together and make sense," Kathy says. "It's a miracle." "I'm happy to be alive," Bob says. 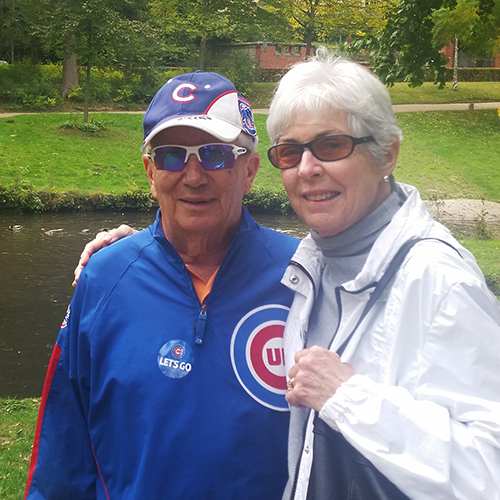 "I'm going to start playing golf again, going to Cubs games and coaching my grandson who plays basketball. We're so grateful." Learn more about spinal stenosis and hydrocephalus.